The Dub Filter is a dual low-pass/high-pass 24/48 dB filter, with resonance and the exclusive Overlap parameter. It is a free device reserved to our Newsletter subscribers. To get it (and all the future free devices we will add). The Dub Filter is a dual low-pass high-pass state variable filter with resonance and overlap factor. Filter: this parameter sets the cut off frequency and the filter type. From -100 to 0 it is a low pass filter with cutoff frequency gradually increasing from 0 Hz to 15000 Hz, from 0 to 100 it becomes a high pass filter with cutoff frequency gradually increasing from 0 Hz to 15000 Hz. 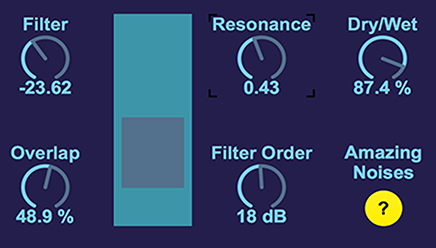 Resonance: this is the amount of resonance the filter has at its cut off frequency. Filter Order: this parameter gradually changes the filter order from 12 dB to 24 dB. Many thanks to Ernest Leonardo Meyer.